In the Pink bought two boats in the spring of 2012 and began building teams of people interested in learning to paddle in the Jacksonville area. We currently have three teams and are known as the Jacksonville Dragon Boat Club. Our teams host the annual Jacksonville Dragon Boat Festival each year in September, which is a fundraiser for In the Pink. The next festival will take place on September 22, 2018. For more information, visit www.jacksonvilledragonboatfestival.com. Jacksonville Dragon Boat Club is also proud to have a professional, world-reknowned dragon boat consultant, Pat Bradley. As an elite dragon boat athlete, Pat has competed at the 2006 Club Crew World Championships in Toronto, Canada, 2007 World Championships in Sydney, Australia, 2017 World Championships in China, and 2014 & 2018 Club Crew World Championships. Our other coaches have learned a lot from Pat and take their roles seriously. Each of them attends Coaching Clinics whenever possible. Our club also hosts Paddling Clinics with premier coaching throughout the year. Our teams have a mission: to introduce dragon boating to the Jacksonville community and get people engaged in a healthy lifestyle. We believe that true winners are people who support their community, engage others in becoming more physically fit in a positive environment, and reach out to people in a time of need. We are continually striving to become better paddlers, all while having fun and enjoying the camaraderie that only a team can provide. Dragon boat paddling has changed all of our lives for the better. Every team member is as important as the next…none of us could do it without the support of our teammates. We allow no negativity on our teams! Only positive spirits allowed! The world in stressful enough…dragon boat paddling provides us with the opportunity to “de-stress” and enjoy life on our beautiful waterways! If you haven’t tried this sport, please come give it a try. You too can get bit by the dragon! Contact Marty Millard at millardm@comcast.net or call 904-536-3475. You can also join us for an introductory paddle by visiting www.meetup.com , typing in Jacksonville Dragon Boat Club, and once there, entering your information, and rsvp’ing for an open paddle. We provide the boats, the paddles, the life vests, and the instructors! 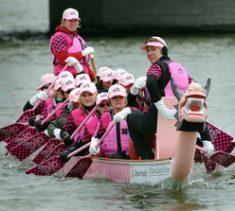 You can also visit www.jacksonvilledragonboatclub.com for more information.